· The Advanced Degree award for 2019 is $500. · Applicant must be currently pursuing an advanced degree in education. · Deadline for receiving application is April 8, 2019. · Award money must be used in-state (Missouri) at an accredited college or university. · Applicant must be currently employed by Republic, Willard, Ash Grove, or Walnut Grove. · Applicant must attend a Missouri college or university with a fully accredited teacher education program. · Applicant must present a letter of reference from principal or superintendent. · The award will be payable to the college or university attended. Notification to the recipient will be by May 6, 2019. Application to be received by April 8, 2019. Alicia Burton is a graduate from Ash Grove High School. She is attending MSU, pursuing a degree in education with an emphasis in early childhood. Currently she works part time at the MSU preschool in the infant class. ​The award will be offered yearly to a candidate who either graduated from or is a resident of Republic, Willard, Ash Grove, or Walnut Grove. The scholarship is designed for an outstanding student from a fully accredited teacher program at a Missouri college or university. The RARSPA committee is Cindy Crabtree, Wilena Farwell, Bev Vernier, and Barbara Self. Kelsey Woods is a graduate from Republic High School. She is seeking a degree in education with an emphasis in early childhood education. 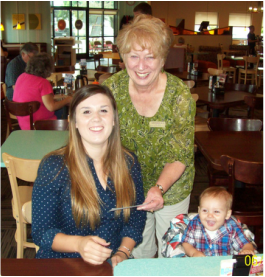 She began her program of study at Ozarks Technical Community College, then studied for a year at College of the Ozarks. She took last year off to give birth and enjoy spending time with her son, Gabriel. She is enrolled at Missouri State University this fall to finish her degree program. Clayton Hamilton is a graduate from Republic High School and is currently studying at Missouri State University. He is seeking a degree in education and plans to become an AG teacher. Clayton is the recipient of the $500.00 scholarship from the Republic Area Retired School Personnel Association. The RARSPA committee is Cindy Crabtree, Wilena Farwell, and Barbara Self. Rachel Dutton, a Missouri State University student obtaining a degree in elementary education, is the recipient of the $500.00 scholarship from the Republic Area Retired School Personnel Association. ​Pictured are Barbara Self, left, Rachel Dutton, center, and Wilena Farwell, right.